George Segal grew up in The Bronx. Initially, he worked in paint and pastels, but began doing sculpture in 1950’s. During his early professional life he taught art in New Jersey High schools. He pursued art full time from 1964 until his death in 2000. George Segal gained international acclaim for his life-size sculptures of people performing everyday tasks. His sculptural works are tributes to everyday people and are very reflective. George also created the three large tableaus for the Franklin Delano Roosevelt Memorial in Washington: ”Depression Breadline,” ”Appalachian Farm Couple” and ”Fireside Chat. The Bus Driver scupture can be seen at the MOMA. It depicts a large man surrounded by, and subjected to the forces of machinery. Just enough of a bus is included so that the viewer can easily recognize the figure as a bus driver. The Abraham and Issac Monument shows Abraham and Issac in contemporary dress and is intended to show the class between ideology and a father’s love. George Segal was commissioned in 1978 by Kent State University to create a memorial to the four students killed during an antiwar demonstration on their campus by members of the National Guard. Kent State officials did not like the finished sculpture so it is installed at Princeton University where George Segal once taught. The Gay Liberation Monument, is installed in Christopher Park across the street from the legendary Stonewall Inn in New York City. It was created by George Segal in 1979. The statues are a tribute to the 1969 Stonewall Riots and honors and commemorates the gay rights movement. This was the first piece of public art commemorating the struggle of gay as lesbian people for equality. 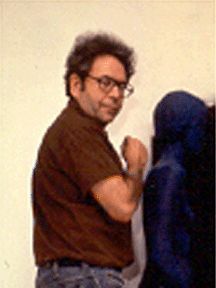 George Segal was awarded the Augustus Saint Gauden’s Award in 1971 and was inducted into the Cooper Union Hall of Fame in 2009. This entry was tagged Augustus Saint Gaudens Award, George Segal. Bookmark the permalink.